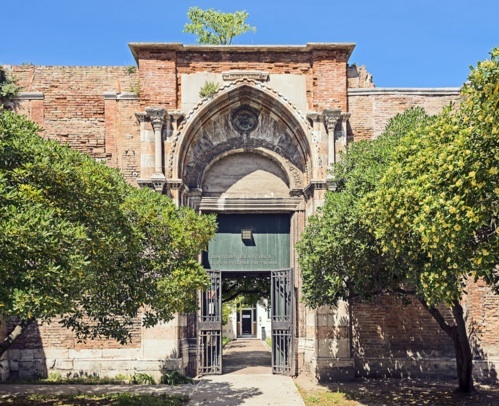 Once this was the third largest church in Venice, an immense complex with dormatories, cloisters and orchards, founded in 1318 for the Servite friars. It was, most famously, the home of Fra Paolo Sarpi, the hero of the Great Interdict, whose statue stands nearby in front of Santa Fosca. Sarpi's good friend Galileo was one of the monastery's illustrious visitors. The monastery was destroyed in a massive fire in 1769, and in 1812, when it was suppressed, most of the other buildings were demolished, their rich works of art scattered around Venice and the world. Sarpi's remains, once buried in the church, were removed to San Michele. Today there's a pair of 15th-century gates, including the romantic Portale di San Pellegrino, and the 14th-century Cappella dei Lucchesi dedicated to the Volto Santo of Lucca. The site was rebuilt as a charitable refuge for women released from prison, the Istituto Canal Marovich ai Servi, which in the 20th century expanded into a school for girls orphaned by the World Wars. It closed in the late 1960s and now serves as the Ostello Santa Fosca.